I think my muse went out west to help fight forest fires last week because I've been in a slump. Normally I stockpile ideas for my columns the weekend before they are due. But today I spent more time tapping that typing. Not giving up easy, I took a steaming cup of java in one hand and my laptop over the other shoulder, I made my way out to the screen porch. Sometimes a slight change in venue gives me better reception. But that didn't happen today. More tapping. 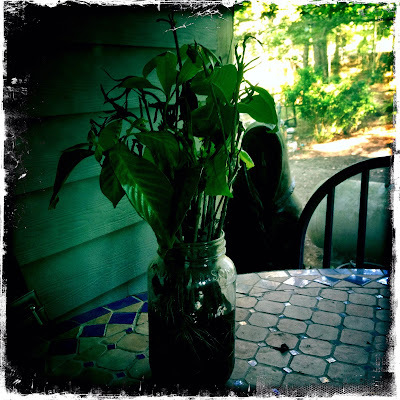 I noticed the morning light filtering through a Mason Jar that was filled with gardenia stems. The stems are from blossoms Jilda broke off in the spring and put in jars. They not only smell amazing, but they also dress up the house considerable. But when the blossoms dry up, she doesn't toss the stems. She puts them in jars of water and sets them on the screen porch. By summer's end, all the stems have roots sprouting from the ends like gray hair. Today when the light came through, I realized the water hadn't been refreshed in a few weeks and was now the color of amber. I noticed something wiggling among the tiny roots. Upon closer inspection, I could see the jar was full of mosquito larvae swimming around like tiny seahorses. I watched them for a while and briefly considered writing a column about how we all undergo many changes in our lives...but I finally tossed the larvae, put fresh water in the jar and wrote my column about it being National Dog Day. As your friend, I advise you to hug your puppy. If I had a puppy, you can bet I'd be hugging it. Puppy hugged! I hope your muse stays safe fighting those fires. And maybe will be home soon. Your posts are equally entertaining even when your muse is AWOL!! My pup got hugged way too much I think! I have no puppies to hug but the one who have crossed over the rainbow bridge. So they have been hugged in my thoughts. My friend has a gardenia plant in her home that she started from a gardenia corsage. She rooted it just like Jilda did. Growing mosquitoes in not a good idea. baahaha.